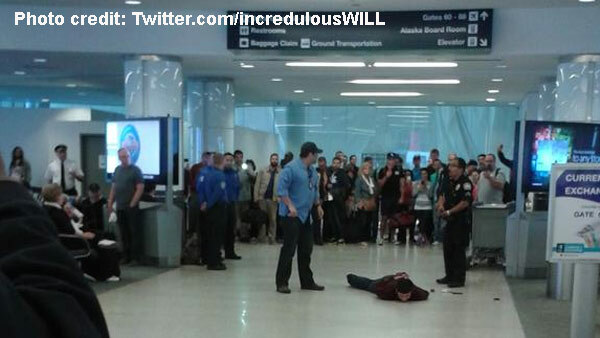 LOS ANGELES -- A man who ran from TSA and LAX officers has been taken into custody at Terminal 6. Authorities say the suspect was not cooperating with TSA officers in the screening area. When airport police tried to assist TSA, the man ran. Officers caught up with the suspect at Gate 66, using a Taser to take the man into custody. Passengers watched in shock, and one mother was seen shielding her child from the commotion. "He had a really strange smile on his face the entire time," said witness Sean Dimond. A number of witnesses recorded the confrontation on their cellphones, posting video and pictures on social media. Paramedics responded and transported the suspect to a hospital for treatment. An LAX spokesperson said the suspect was not armed. Alaska Airlines confirmed to Eyewitness News the suspect was a ticketed passenger on Alaska, but for a flight that wasn't scheduled to leave until 8 p.m. The suspect faces potential charges of trespassing and obstructing a peace officer.